A veteran of the New Jersey metal scene, the formation of ETHERIUS by guitarist Jay Tarantino in 2017 was inspired by extensive recording and touring experience gained as rhythm guitarist for instrumental virtuoso Angel Vivaldi. Looking to step out from the "sideman" role and lead his own project, Jay sought to create a band that made music unlike the djent/electronic stylings of the current instrumental guitar scene. Looking to combine his love of old school thrash bands such as MEGADETH, TESTAMENT, and ICED EARTH, with neoclassical shred and progressive metal, Jay enlisted the services of his old friend and drummer/producer Zaki Ali after a chance encounter at the Winter NAMM convention in early 2017. The lineup was finalized a few months later with the addition of bassist Chris Targia and second guitarist John Kiernan. 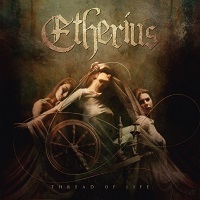 Today, they present the EP, “Thread of Life,” which contains five tracks. “Lament” sound about as you would think based on the title. Weeping lead guitar leads off the sound under slow moving but heavy and deep instrumentation. The bottom end is thick, as the lead notes venture out above with skill and dexterity. “March and Defy” has that Neo-Classical shredding that was discussed in the bio section above. It’s a blistering fast song at first with a tinge of Power Metal, and later transitions into a slower bridge section before the maddening flurry of lead guitar notes continue once again. “The Inevitable End” showcases some Proggy chops in the rhythm and meter, while the adept lead guitar buries the strings in a technical display of skill. Some thunderous heavy passages remind us that we are listening to Metal, and not just instrumental guitar work. There are lots of complexities and nuances in this track in particular. “The Soothsayer” has a Classical sounding melodious romp, with distinct alternating passages that would mirror a verse & chorus exchange if there were vocals. Hardened and steadfast at times, and wide open and breathing at others, the combination is done with sophistication and applied musical theory. “Thread of Life” closes the album, with a delicate opening melody. It brings an emotional element to the album, along with the aggressive and furious passages that run throughout the song as well. You can feel yourself wanting to sing along with the lead guitar notes in their legato presentation, and be pulverized by the attack of the heavier passages. Overall, this is a great EP by a seasoned guitarist stepping into the lead role for the first time. The compositions are thoughtful and intelligent, and display great skill and “feel” in the music. We all know how great Angel Vivaldi is a songwriter and guitarist, but I would venture a bet that he loves this solo work of Jay Tarantino here.